This was a big transition week for our family as we adjusted from sleeping in and days without a plan to waking up at 6:30am and rushing out the door. Needless to say, we are still smoothing out the morning kinks! I decided to make some burritos this afternoon to ease some of the breakfast-making pressure. 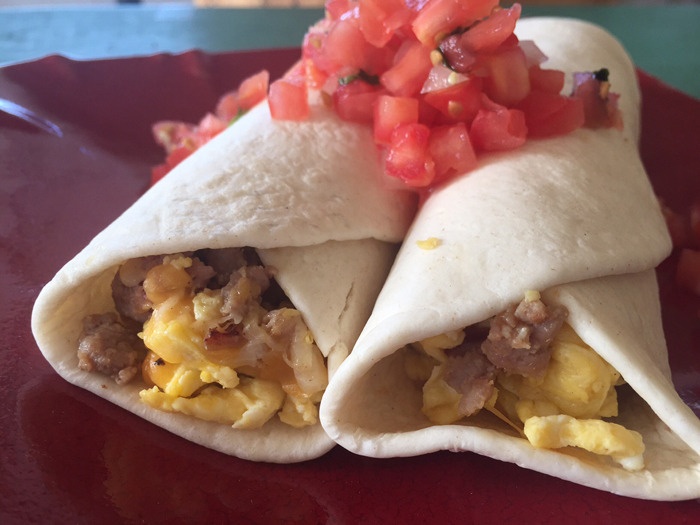 These Make-Ahead Breakfast Burritos are a hit with kids and adults in our house. I usually make a double batch and toss them in the freezer for the week. Have you ever had one of those morning where you had to eat in the car? Well, this is the perfect meal solution for that too! I like to change the burrito recipe up by using different Eckert House-made sausages. My favorite sausage is the Bacon Applewurst but Chris really likes our fresh Chorizo. Applewurst and Italian Sausage are also tasty! Would you like to watch our culinary staff make these delicious burritos and taste them for yourself? Join us January 27, 2016 for a Lunch and Learn Class called Breakfast for Lunch! Remove sausage from casings; discard casings. Heat a large nonstick skillet or nonstick electric skillet over medium heat. Place sausage in skillet and break up as it browns. Cook until lightly browned about 4 to 6 minutes. With a slotted spoon remove to a bowl; set aside. Drain fat from skillet. Add butter to skillet. When butter is melted, pour in scrambled eggs. When eggs are softly cooked, remove skillet from heat and sprinkle with sausage and cheese. Divide flour tortillas into stacks of 3. Place between two damp paper towels and microwave about 5 to 8 seconds. Turn stacks over in microwave and heat another 5 to 8 seconds. 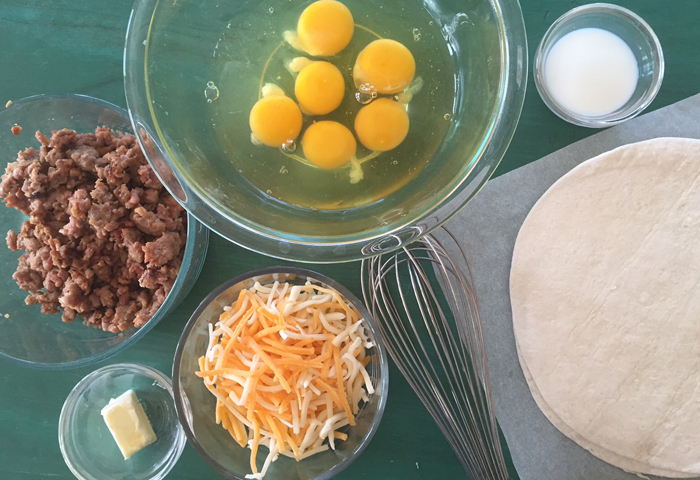 Divide the egg filling on each warmed tortilla. When cooled, wrap each tortilla individually in plastic wrap and place in a dated freezer bag. Freeze up to 1 month. Makes 6 servings. Remove burrito from the freezer. Remove plastic wrap. Wrap frozen tortilla loosely in a paper towel. Microwave about 30 seconds on high heat. Flip burrito and microwave another 30 seconds or until warm. (Reheat times vary by microwave). Serve with Eckert’s Fresh Salsa.